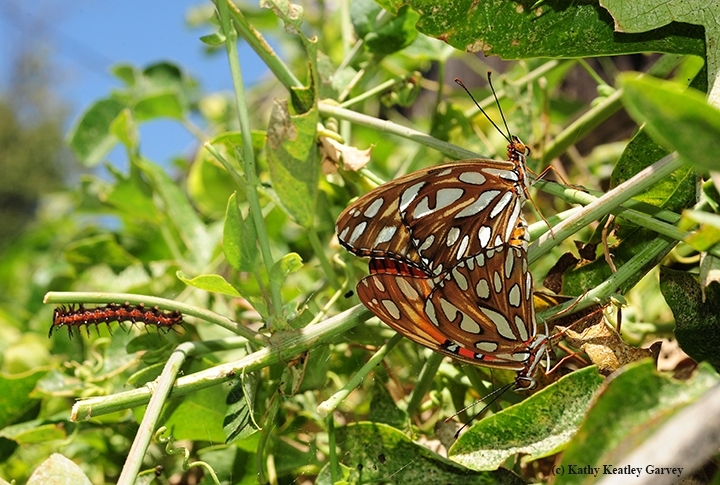 And by--what else--the "passion butterflies," Gulf Fritillaries (Agraulis vanillae). We came across the scenario below by accident. We were watching a Western scrub jay (now known as a California scrub jay, Aphelocoma californica) methodically fly over to the passionflower vine (Passiflora), perch on the fence, and dine on multiple caterpillars. See, the scrub jays are nesting in our cherry laurels, and the Passiflora is their supermarket for "grocery" selection, checkout, and take home. For the last several weeks, the scrub jays have been pigging out like human celebrants at a Thanksgiving feast. Yes, birds can pig out, too. As predators, the jays have dominated and overpowered the vine and snagged almost all of our caterpillars...caterpillars that were just trying to become butterflies. Then three things happened: (1) Hawks appeared in the neighborhood (2) Western scrub jays began vanishing and (3) the triple-digit weather set in, with dozens of Gulf Frits gathering on the Passiflora. It became a bedroom and nursery of sorts. The jays' supermarket wasn't so "super" anymore. More hawks. Fewer jays. More eggs, caterpillars and chrysalids. 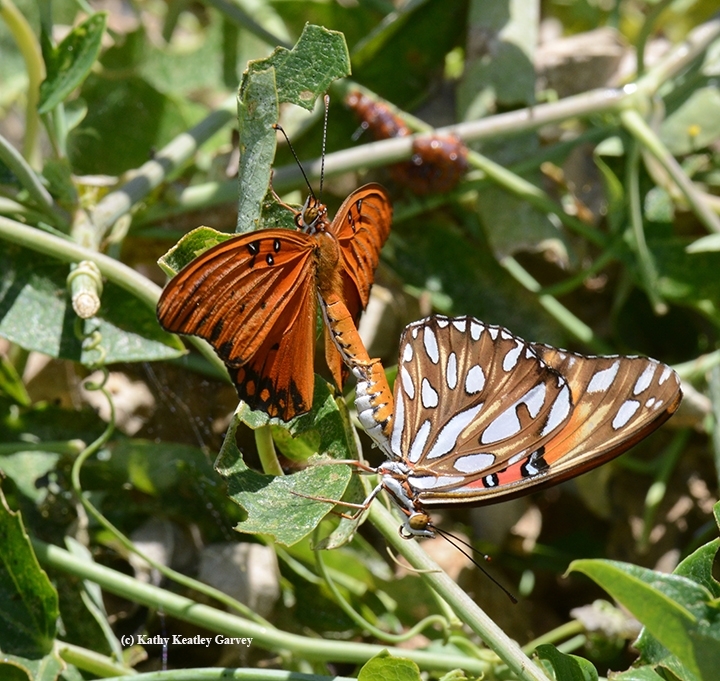 Like many butterfly aficionados, we welcome the orangish-reddish butterfly with silver-spangled underwings. It is as spectacular as it is showy. Butterfly guru Art Shapiro, UC Davis distinguished professor of evolution and ecology, has been monitoring the Gulf Frits and other butterflies in Central California (see his website) for more than four decades. 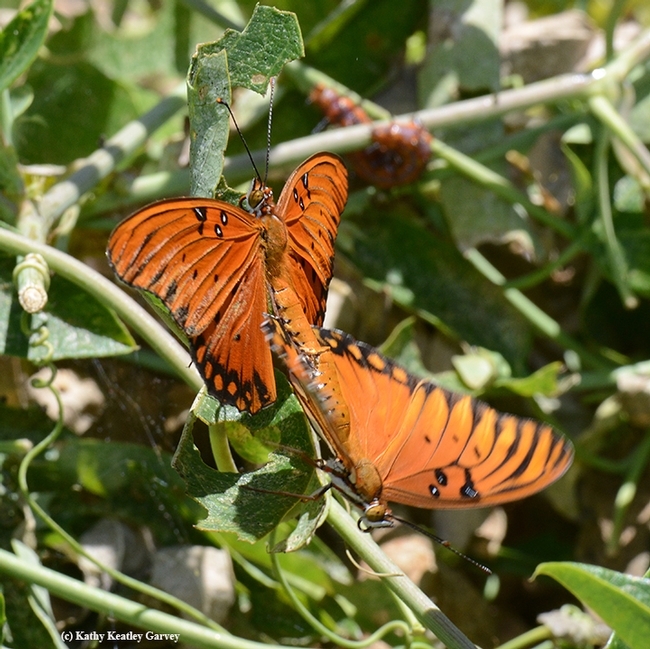 The butterfly, found in many parts of the world, was first documented in Southern California in the 1870s, according to Shapiro. The history of the scientific name of the species is fascinating. Vanillae? That was an error traced back to German-born naturalist and scientific illustrator Maria Sibylla Merian (1647-1717). She knew butterflies--she reared them--but she took some artistic liberties. Merian drew the Gulf Frit on a vanilla orchid, and scientists assumed that this was the host plant. Not so. The host plant is Passiflora. "Johannes Fabricius knew that the bug eats Passiflora and tried to rename it passiflorae," wrote Shapiro in a 2008 edition of the Journal of the Lepitoperists Society. It didn't take. So Agraulis vanillae it is.